Ascending Butterfly: Kettle Cuisine Review and Giveaway! This giveaway is now CLOSED. Thanks so much to our wonderful sponsor Kettle Cuisine, We look forward to working with you again! The winners have been notified and upon confirmation his/her follower name(s) will be posted both here and on our homepage. Remember: There are still some great giveaways active on the upper right hand side of the page! Ƹ̵̡Ӝ̵̨̄Ʒ - The North East has been pelted with snow this winter. And the weatherman is saying there will be more snow this week! I'm getting pretty snowed out and a bit stir crazy to be honest with you, but one thing still holds true for me, nothing is better when it's cold outside than a warm bowl of soup! Nothing says comforting to me more, and there is definitely nothing that I want to eat more when I have a cold or the flu. I recently had the opportunity to try what I'd like to call a 'hot bowl of comfort' from Kettle Cuisine. Two hot bowls of comfort actually! I sampled the 'Angus Beef Steak Chili with Beans' and the 'New England Clam Chowder' and they were absolutely perfect on a cold winter's Day. There are ten chef-inspired varieties that are all natural and all gluten free. The savory soups, hearty chilis, and rich chowders are available in convenient, single serving bowls and can be found in your grocer's natural food freezer. They arrived in an insulated box packed with dry ice, these are in no way like the canned soups you are used to. 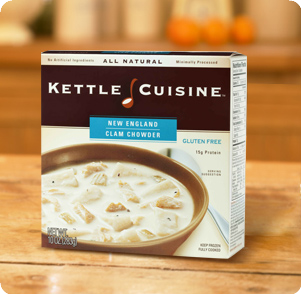 Equal parts rich and satisfying, Kettle Cuisine's New England Clam Chowder starts with fresh light cream from local New England dairies, then we add hand-shucked clams, perfectly sautéed onions, and potatoes peeled just moments before cooking. 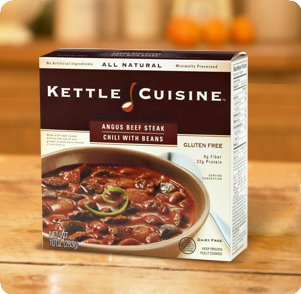 Kettle Cuisine's slow-simmered Angus beef with a blend of Southwestern spices, red beans, ripe tomatoes, hand-chopped peppers and spicy green chilies for a chili as hearty as it is wholesome. They were both fresh and very tasty. The chowder wasn't as thick as I am used to in a traditional clam chowder, but I expected that as these are specially prepared with gluten free, dairy free diets in mind. The clams were fresh and there was tons of potato in it, it was hearty even though it wasn't thick. The Angus Beef Steak Chili with Beans was my favorite of the two. It was amazingly hearty and very satisfying! How to Win: (1) You must be a PUBLIC follower of Ascending Butterfly to be eligible for this and all giveaways. Indicate in your entry that you follow (if your 'comment name/user id' differs from your profile id, please let me know what name you follow under) and (2) Visit Kettle Cuisine and pick another soup (other than the two being reviewed!) that you like and leave the LINK to that soup in your comment entry! (3) You must also leave your email address somewhere in your comment. (You can format it this way for security, example: ascendingbutterfly AT mail host DOT com, If it is visible in your profile, just say so, that's OK!). Please follow the easy 1, 2, 3 steps to winning! This giveaway is open to USA residents who are 18 years of age or older. (Leave a comment with the tweet’s url so you can get a valid entry (click on the time your tweet was sent to get the direct URL and then copy and paste it here). FTC Disclosure Info for this Giveaway: This is not a paid insertion. This is a non-compensated post and all opinions regarding the product are expressly my own experiences. I was provided product to review and the sponsor is also fulfilling product to prize winner(s), this in no way influenced my opinion of my experiences with this product. All product provided by Kohnstamm Communications on behalf of Kettle Cuisine. I would love to try chicken corn chowder. Follow @Tracy Inglesias on Twitter. Grilled Chicken and Corn Chowder , that sounds good to me! The Chicken Chili w/White Beans sounds reaaly good. I follow your blog. I love the Grilled Chicken and Corn Chowder! I follow Kettle Cuisine on Facebook and told them you sent me. I would choose the 'Grilled Chicken with Corn Chowder' and I follow your blog publicly! My email address is visible in my profile.